Moderate. This section has two main climbs. Neither is big or steep. Mainly on cycleways or quiet roads. There is one section on the SS48 which can be busy — especially on summer weekends. Entirely on surfaced roads or cycleways, although there is a two-kilometre section of aggregate-surfaced cycleway from Canazei which you can take if you prefer. Easy to follow: the cycleway sections are well-signposted. On the roads you are reliant on the normal road signs. 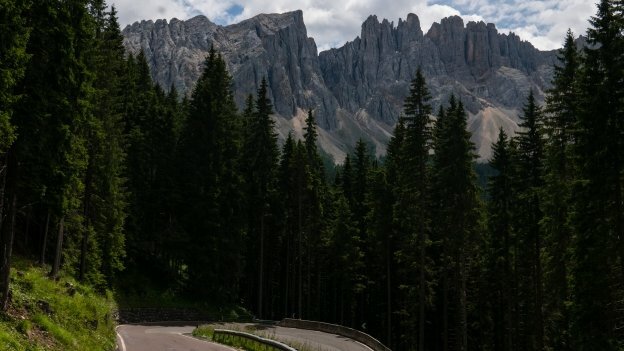 The route follows the Pista Ciclabile delle Dolomiti Val di Fassa Val di Fiemme from Campitello to Pozza di Fassa. 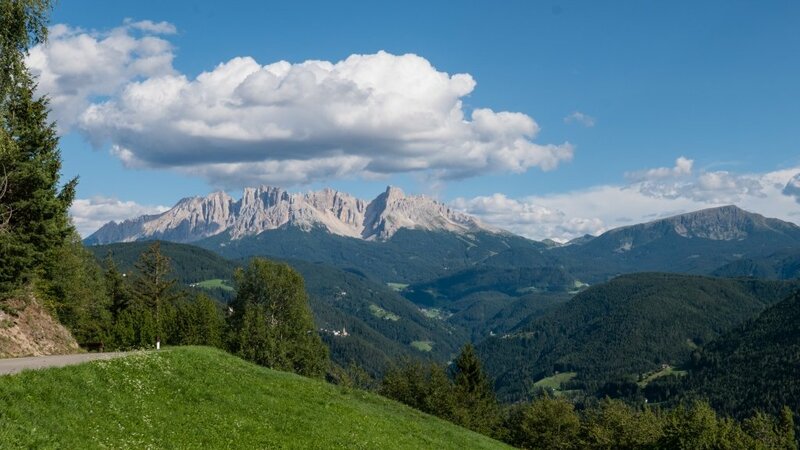 You could continue on the cycleway to Molina di Fiemme and from there take the SS612 road through the Val di Cembra to Lavis, from where you can take the main Adige cycleway. The end of the route connects with the Brennerradroute, a section of the major cycleway that runs south to Bozen (and on from there to Trento and Verona) and north to Brenner. The Pista Ciclabile delle Dolomiti Val di Fassa Val di Fiemme cycleway from Cianacei (Canazei) follows the right bank of the river (the Torrente Avisio). The surface of this section is compacted aggregate. This is generally in good condition, and most people should not have a problem with it, but if you prefer you can take the road and then pick up the tarmac-surfaced cycleway at the village of Fontanazzo. Coming out of Cianacei I took the SS48 to Campitello di Fassa. This was OK, but it looks like a better option would be to make the Via Roma and then the Via del Ciuch. The cycleway brings you into the centre of Pozza del Fassa. 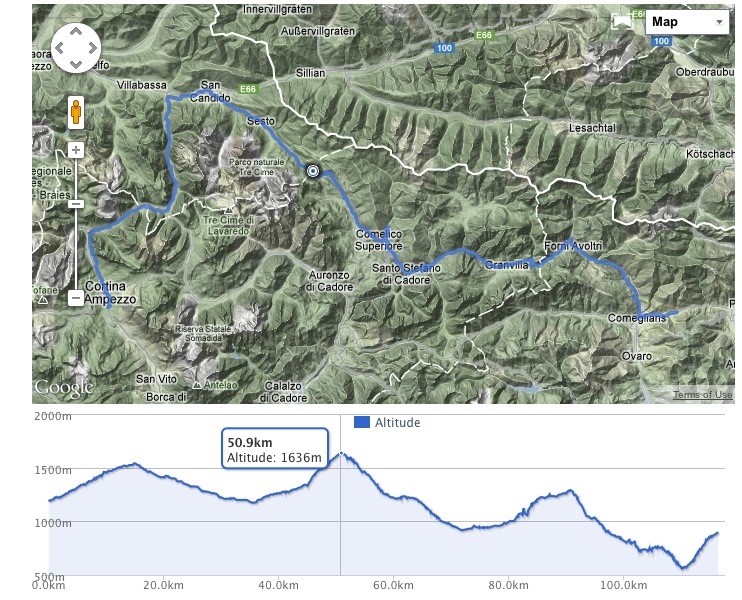 You then have to take the SS48 for 1.2 kilometres, and then turn right just after the Hotel Dolomiti. There's a sign for the Museo Ladin. The road swings round behind the hotel and then takes you past the Co-Op super­market, and the Museo Ladin de Fascia. When I rode the SS48 on a Saturday morning, it was busy with traffic going towards Cianacei, but once I got off the main road, it was much quieter. 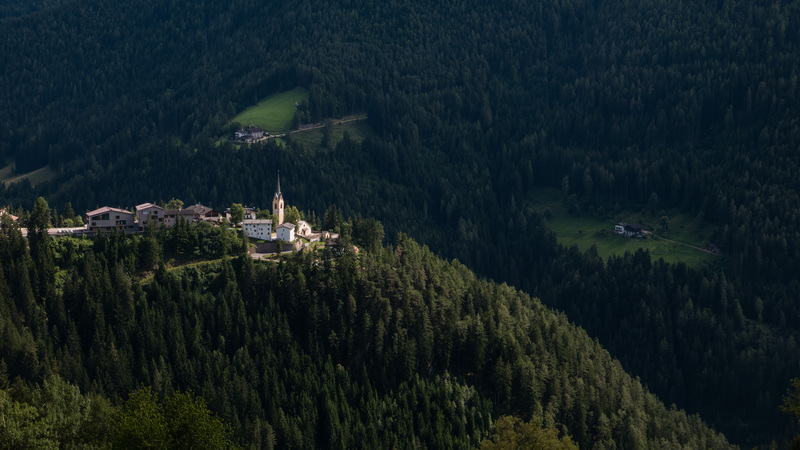 The route takes you through the centre of Vigo di Fassa, before joining the SS 241. From here you climb to the Karerpass (Jouf de Ciareja/​Passo di Costalunga) about 8 kilometres from Vigo. The pass is at 1750m altitude, but the main bulk of the climb is over the first 4 km or so that take you to 1720m, and after this, the road pretty much flattens out, with a stretch of spectacular corniche road following the edge side of the valley. As the road approaches the pass you should get your first view of the Latemar group to the left and the Rosengarten group (Catinaccio in Italian and Ciadenac in Ladin). The German name comes from a Ladin legend. At the pass itself, there are a couple of hotels or restaurants and bars and further on down this another one. At the next junction continue on the SS 241 the left following the signs Welschnofen (Nova Levante) and Bozen (Bolzano) and the Karersee. As the road descends, it crosses the border into the Südtirol. There's no shortage of places to stay around the pass, a little further on down is the splendid Grand Hotel Krez, which, with the Rosengarten mountains behind it, defin­itely looks very grand. Confusingly, the Karersee (the lake) is not actually in Karersee (the place), but continue on the road, and you won't miss it. On the right-hand side, there is a car park with a cafe and toilets, but you could just leave your bike by the bus stop and head down the steps to the lakeside. The lake is set against the backdrop of the Latemar mountains. The name in Ladin is the Lec de Ergobando — Rainbow Lake. The name comes from another Ladin legend, inspired by the reflec­tions of the mountains in the lake. After the Karersee, the road descends down into the Eggental and into Welschnofen (Nova Levante). The German name reflects the fact that the original settlers of the village were Ladin speakers. The route turns off the SS241 at Welschnofen. The main road continues from the Welschnofen (Nova Levante) to Bozen passing through a narrow and deep ravine. It's a dramatic road, but unfor­tu­nately, a lot of work has had to be done to make it safe. This has meant building several tunnels — the longest is about 3 kilometres long. Much of this work has taken place since the Google Streetview car last passed by, so there's no way of checking to see whether these are open-sided rockfall shelters or completely-enclosed tunnels. In any case, it's also possible that this section of road is off-limits to bikes. Either way, it seems better to avoid it. Instead, the route takes to a very quiet road high on the valley side. I don't know whether it's better than the road through the gorge, but I think it's a cracker, and the final descent down into the valley of the Etsch (Adige) river is a glorious finale. In Welschnofen it's time to turn off the SS 241 — bear right at the fork in the road with the Farmacia Latemar on the corner, turning onto Gummerstraße, following the signs for Gummer. When the Gummerstraße comes to a junction above Gummer itself, turn right, following the signs for Bozen (Bolzano) and Steinegg (Collepietra) and into Obergummer. The altitude is about 1288m and the road, a quiet country lane, continues high on the valley side. If you look back you can get a last glimpse of the Dolomites; you can also see the Gummer church tower looking out over the Eggental. At the top of the climb, there's a little chapel, with a water tap. Here you turn left following the signs for Karneid (Cornedo). There's still time for one final backward glance. If you're impatient to start the descent, hang on a little bit longer, as it's another kilometre or so before the road starts to descend in earnest. A little further on, there's a jausen­station (snack bar/​cafe) just off the road on the right-hand side. It's a gorgeous, long, flowing descent. 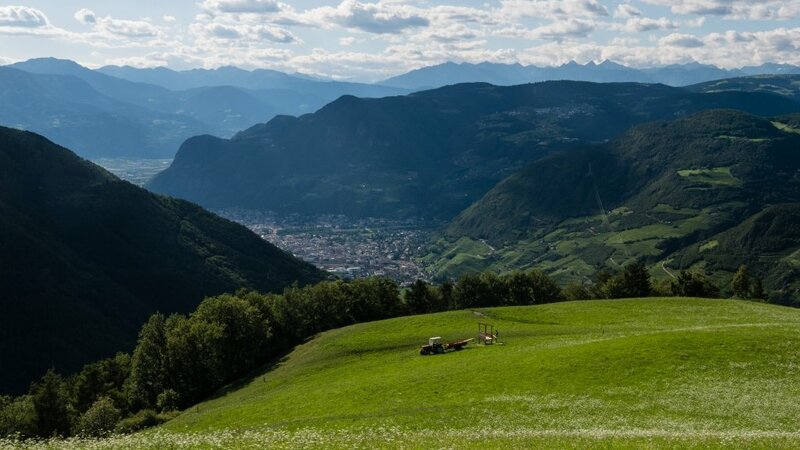 It's mainly through ancient woodlands of oak and beech trees, but there are a couple of moments when you get a superb view down over the valley of the Etsch (Adige) and to Bozen (Bolzano). As you descend, woodland gives way to trees and vineyards. The road is generally in good condition, but there are occasional moments when you need to watch the surface, and, as you come into Sankt Veit (San Vito), there are even a couple of speed bumps. The last part of the descent is fabulous too, with views of the vineyards of the Etsch Valley terraced steeply down the valley sides. The road comes down into the surpris­ingly quiet and peaceful centre of the village of Kardaun (Cornedo). Look out for the mural on the sides of the rathaus (council offices) . In the little square, there's a charming water fountain depicting St Christopher. The Bistro Rathaus (Rathauscafe) opposite is a good place to stop for a drink or something to eat. It's very popular with locals at lunchtime. You should see the signs for the Etsch cycleway (Etsch Radweg). Coming out of Kardaun there's a surpris­ingly peaceful cycleway which runs between the river on the one side and vineyards on the other. If you have a moment take the time to look, and in the far distance you should be able to see the gleaming peaks of the Dolomites. 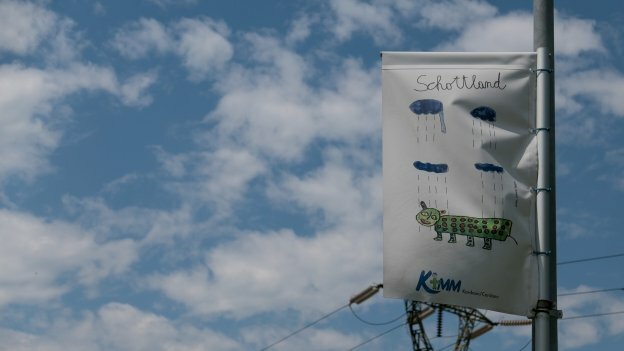 This stretch is decorated with flags that are part of the Kunst Radweg (artistic cycleway) project. The artwork shows the world as seen by the children of the village. Look out for the flag depicting Scotland which seems to show what I think is the Loch Ness monster in the rain. A little further on the Kunst Radweg comes to an end, and there is a sign welcoming you to Bozen (Bolzano) city of the bicycle. Bozen has one of the highest rates of cycling in Italy with over a quarter of people using bikes as their regular means of transport. The city has recently announced plans to spend almost a million euros on further improving its network of cycleways. There's no shortage of places to stay in the Val de Fascia, with dozens of hotels in Cianacei alone. There's also then plenty of choice at Karersee and around the Karerpass, in Welschnofen and then Bozen. The only hostel I know of on this section of the route is the Jugendherberge Bozen. Camping Marmolada is within walking distance of the centre of Canazei. It's a popular base for climbers, and they are used to squeezing people in. After that, the next campsite is on the other side of Bozen: the Camping Moosbauer. The campsite is located among orchards and vineyards on the outskirts of town. It has a restaurant, shop and pool. I partic­u­larly like the way that the owners are trying to offer some insight into the history and culture of the Südtirol. In particular, there's the 'Learning Sanitary Block' where you can read about the area while you clean your teeth, or read about the local wines while you do the washing up. But, please note that the area for tents is tiny, and in high season there's a big demand, and, as they themselves say, at times it can be 'squeezy'. The site does indeed seem to try to squeeze everyone in, but they also say that they cannot guarantee space. You can ring them in the morning and, depending upon demand, reserve a space for that evening. If you are planning to stay for three nights or more you can reserve a pitch of your own. 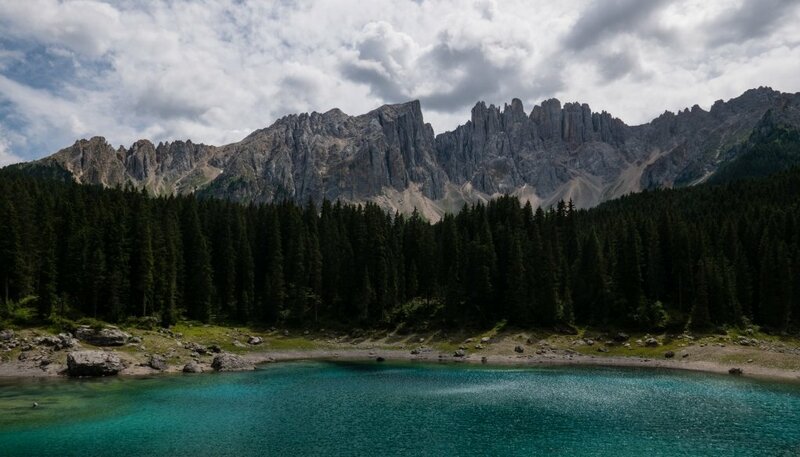 If you are just planning to stop for the night, and not explore Bozen, then it may be worth looking at one of the campsites further south of the city. The nearest train stations are in the Etsch (Adige) valley to the west — either at Bozen or Lavis. So if you have a showstopper problem, you'll need to take a bus. In the Trentino, you can transport bikes on the 'extra-urban' coach services run by Trentino Trasporti. The number of bikes depends on the available space, but they say that on average there is enough space for two bikes. Also, some of the tourist shuttle bus services are equipped with racks for bikes. For more inform­ation see ttesercizio.it: trasporto biciclette. According to Sudtirol Mobil some extra-urban buses can carry bikes in the baggage compartment. The website is a little vague: it talks about single/​individual bikes (plural) so that might be one, or it might be two, depending on how much space there is. Unfortunately, the page isn't available in English but If you want to see it in either German or Italian then go to mobilitaaltoadige.info: limits for the transport of bikes. If you know of other bike shops, or you spot a mistake, please let me know. visittrentino.info (it/​en/​de/​pl/​cs/​ru) — tourist inform­ation site for the Trentino region.